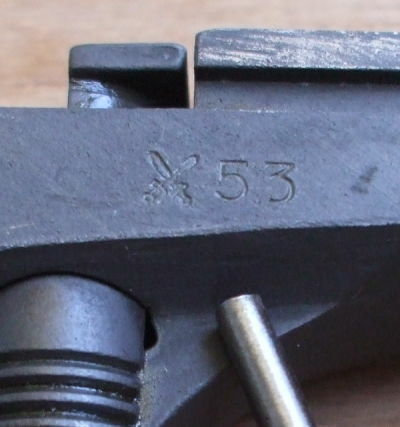 A typical ČZ-52 pistol bears a number of distinctive and meaningful markings. 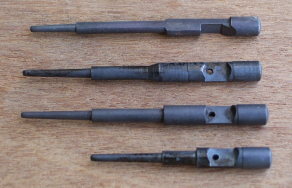 They indicate whether it was manufactured for the military or for civilian use; the year of its manufacturing; whether it has been refurbished; and the serial number on the frame, barrel, and slide. However, there is a lot of misunderstanding and wild rumors out there. Some people think that some subtle punch marks on the slide indicate this this pistol is more accurate. Many of these enthusiasts ready to become ČZ-52 snipers are probably the same ones who go on at length about the "super-hot Czech load" ammunition and its supposedly useful feature of penetrating ballistic vests and other personal armor. Or who claim that only the ČZ-52 is strong enough to handle such ammunition, despite it having thinner chamber walls than the Soviet TT-33 and its clones. Let's take a calm look at ČZ-52 markings. The left side of frame carries the serial number plus a code for factory. The code rid as seen here indicates that the pistol was manufactured for the military. Civilian arms were instead marked either with the factory name Česká Zbrojovka Strakonice or the acronym ČZS. The right side of the frame carries arsenal marks. Above the trigger guard on the right side of the frame we see a Czechoslovakian Army acceptance mark. This shows two crossed swords plus the last two digits of the year of manufacture. The Czech Army used crossed Roman swords as its symbol since their independence from Austria in 1919. The Czech Republic Army uses this symbol to this day on everything down to uniform buttons. If the pistol underwent arsenal refurbishment, you will find a circle or oval with VOP or VOR to indicate the miliary repair service organization. The importer typically marks the pistol on the bottom of the frame between the trigger guard and the muzzle. 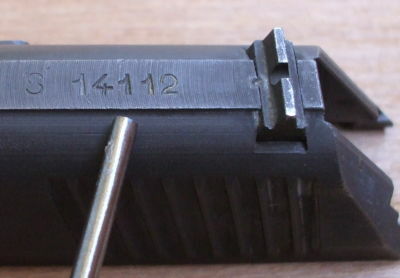 The barrel, where it is visible through the port in the slide, bears the serial number plus a military testing mark in the form of a letter T inside a circle. The frame around the magazine well often bears some small stamped letters, digits, or symbols. 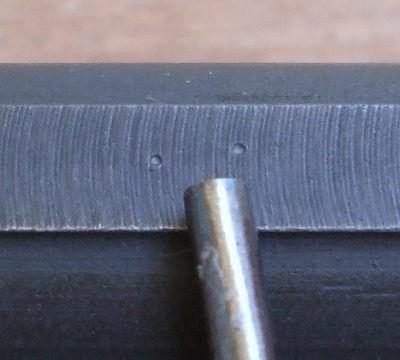 The marks, possibly rather indistinct, may indicate a specific worker or a successful stage in a manufacturing process. 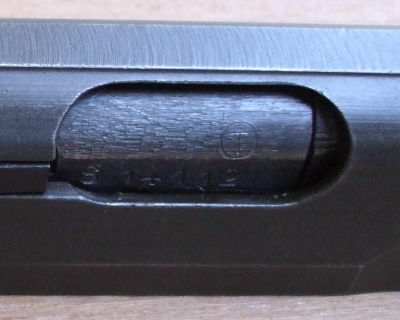 The top of the slide carries another copy of the serial number, immediately in front of the rear sight. You may find some small punch marks on the top of the slide, forward of the ejection port. There are rumors, apparently with no basis, that these punch marks indicate the result of some accuracy test. Those marks seem to be meaningless, or at least they have nothing to do with any accuracy test! See below for a letter on this topic from the deputy director of the armory. 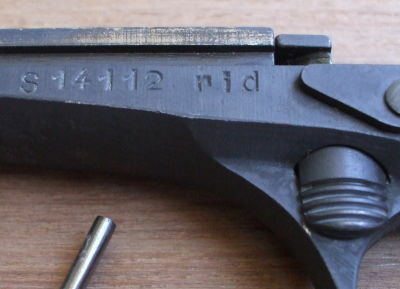 The letters VOZ (military repair plant) plus the last two digits of the year (of re-work) stamped above the trigger. The number following VOZ, usually number 1, identifies the plant. Thank you for your mail. We are very pleased to answer your questions. This pistol is of army origin which were at the Czech armament. 1 - right side of the pistol. The frame over the slide. a/ mark VOP or VOZ is an abgreviation of a military repair service company of firm. These marks are in a circle or in an oval. c/ circle with marked letter T that is a military testing mark. e/ mark of the government test with 2 numbers of the year of the test. 2- left side of the pistol. a/ production number and a code of a factory for example - rid for military arms. The civil arms were marked - eské zbrojovka strakonice. b/ number of test ocument of the government test and testing mark.